Visit the Magical Circuit of Water. Transfer from hotel to the bus terminal. Flight from Lima to Huaraz: 8:30 hrs to 9:40 hrs for the third day: Asking this service. 6:00 hrs Transfer from Huaraz to hotel. Afternoon: City tour and visit Huaraz wings Baths of Monterrey. Overnight at hotel in Huaraz. Tour the Nevado de Pastoruri. Visit Cahuish Tunnel and Laguna Querococha. 6:00 hrs Bus Transfer from the Hotel. Afternoon: Tour Pyramids of the Sun and Moon. Tour to the archaeological complex of El Brujo. Overnight at hotel in Trujillo. Tour the ruins of Chan Chan: Located 4kilómetros Trujillo. Lunch at the fishing village of Huanchaco where we will observe the Totora Horses (pre-Inca vessels at sea). Afternoon: Tour Horses of step with their respective Chalanes. Travel by bus from Trujillo to Chiclayo (3 hours). Transfer from the Hotel Chiclayo. Tour Royal Tombs of Sipan. 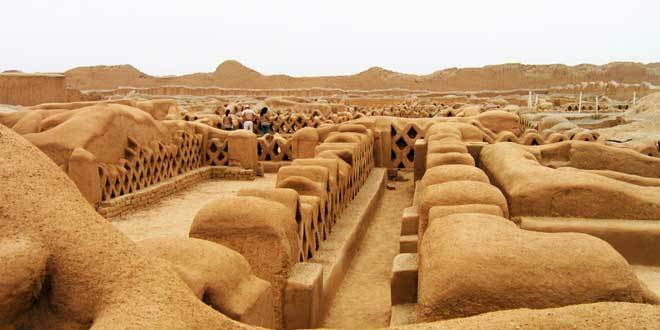 Tour the archaeological complex of Huaca Rajada. Travel by bus from Chiclayo to Cajamarca from 13:45 to 20:30 hrs (8 hours). Moving the bus station to the hotel. Overnight at hotel in Cajamarca. Cumbemayo Tour, Bellavista, Laizón, Forest Park, Stone Forest, the Sanctuary, the Aqueduct, the Stone of Sacrifice. Excursion to Collpa and Los Baños del Inca, Pozo del Inca, The Perolitos. Excursion to the Necropolis of Otuzco, La Hacienda Tres Mills, the Garden of Hydrangeas and Fundo Los Alpes. Transfer to the airport hotel in Cajamarca. Transfer from Lima airport to the bus terminal. Travel by bus from Lima to Paracas (14:00 p.m. - 19:00 hrs). Transfer to the bus Paracas in Paracas. Travel by bus to Paracas to Nazca (17:10 p.m. - 21:00 hrs). Transfer from the hotel in Nazca Nazca. Transfer to the airport of Nazca. Tour over the enigmatic Nazca lines 40 minutes. Transfer to the bus to Nazca. Travel by bus from Nazca to Arequipa (14:30 p.m. - 23:00 hrs). Welcome and transfer terminal in Arequipa Hotel. Tour to the Colca Canyon (the deepest Canyon of the World). In the afternoon visit to the baths "La Calera". Travel by Bus Transport Chivay to Puno 4M (from 13:30 hrs to 19:15 hrs). Hotel to bus station in Puno. Guided tour from Puno to Cusco (all day from 8:00hrs - 18:00hrs or so). Transfer from the Cusco tourist buses to the hotel. 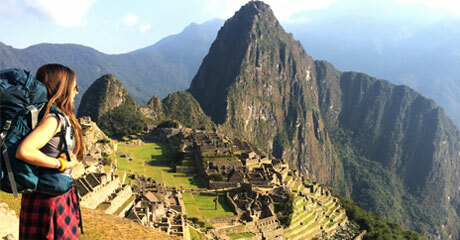 Tour the Sacred Valley of the Incas (all day from 8: 30hrs-19: 00hrs). Farewell Dinner Show at the Restaurant El Truco. Transfer from the airport of Puerto Maldonado to the pier. Boat trip on the river Madre de Dios. Overnight at Eco Amazonia Lodge. Walk through the Rain Forest. Appraisal of animals in the wild, otters, alligators, turtles, tapirs, birds, etc.. Transfer to the airport of Puerto Maldonado. Farewell dinner at the Restaurant "Sulco Manor." Hotel in Lima Transfer to the airport. Important: Peruvian tourists who have their valid ID receive a discount of $ 20.00, the cost of the tour at the entrance to Machu Picchu. All proceeds to the tourist places to visit within the package. All transfers: Hotel-Airport Hotel, Hotel-Bus Terminal-Hotel, Hotel-Train station-Hotel. Transportation and professional guide for all tours. Tour in the Magical Circuit of Water. Tour "City of Kings" Lima. 1 bus ride Lima-Huaraz (Approx 8hrs). Callejon de Huaylas Tour - Lake Llanganuco. Tour Chavin and archaeological sites of the Place. Tour Pyramids of the Sun and Moon. Tour ruins of Chan Chan, Huanchaco Wellness Visit. Lunch at the Caleta de Huanchaco. Horse show in passing parade and exhibition of the Sailor. Tour Royal Tombs of Sipan - Pyramids Tucume. Cumbemayo Tour, Bellavista, Layzón, Forest Park. Cemetery Tour Otuzco, the Hacienda Molinos. Tour Ballestas Islands - Paracas Reserve. Flight over the Nazca Lines and Chauchillas Cemetery tour. 1 bus ride from Nazca to Arequipa. 1 bus ride from Chivay to Puno. Tour Lake Titicaca, Uros Island. Farewell Dinner Show at Restaurant Trick Cusco. Lost Lake Tour, appreciation of Animals. 2 Breakfasts, 2 Lunches and 2 Dinners at the Lodge. 2 Nights at Hotel in Lima. 3 Nights at Hotel in Huaraz. 3 Nights at Hotel in Trujillo. 2 Nights Hotel in Chiclayo. 3 Nights at Hotel in Cajamarca. 1 Night at Hotel in Paracas. 1 Night at Hotel in Nazca. 1 Night at Hotel in Colca. 2 Nights Hotel in Arequipa. 1 Night at Hotel in Aguas Calientes. 25 buffet breakfasts at hotels and 2 breakfasts at Eco Amazonia Lodge. First day: "Welcome to Lima and Tour Magical Circuit of Water." Once you arrive in Peru our staff will greet you at the Jorge Chavez airport in Lima and transfer to your hotel after a break will pick you up from your hotel for the tour in the Magical Circuit of Water, the complex largest sources World.In this edition, you can enjoy a wonderful show that shows a perfect conjunction and harmony of water, light, music and images. This circuit includes 13 water sources, each with a distinct charm, and finally they will transfer to your hotel (Circuito Magico del Agua Lima). Second day: "City tour in Lima to visit the Huaca Pucllana and Tour to Pachacamac." Third day: "Welcome and City Tour in Huaraz." In the morning we will be waiting at the bus terminal to welcome you and transfer you to hotel where you can relax in the morning, the afternoon will be picked up from the hotel to make the visit to the city of Huaraz, including the Plaza Staff and the Regional Museum of Ancash (lytic Museum South America's largest), the temple of "Lord of Solitude," Jose Olaya Street, the fish, Mirador del Pinar, and the hot springs of Monterrey. He moved to the designated hotel in Huaraz. Fourth day: "Callejon de Huaylas and Llanganuco Lagoons." After taking breakfast we will transfer you to make your tour in the Callejon de Huaylas, we see that wealth is varied folk customs, traditional dress, cuisine, crafts of the peoples of Carhuaz and Yungay. Penetrating the Cordillera Blanca visit the famous Llanganuco at 3.850 m (Chinacocha and Orcocha), where you can make a boat ride and enjoy the impressive flora and turquoise color that has this beautiful lake and do a little walk looking the majesty of the mountains Huascaran, Yanapaccha, Paracas and Huandoy.Continuing the tour will visit the city of Caraz (lunch), where you can visit small factories of dairy products and other products of the region as blancmange, frozen fruit and liquor, honey, jelly, cheese, etc.. In the afternoon return to your hotel in Huaraz ubicándole (Photo: Lake Llanganuco). Fifth day: "Tour the Pastoruri glacier." Sixth day: "Tour the Temple of Chavin." Early morning pick up from your hotel for the visit the archaeological site of Chavin, one of the oldest civilizations of America, with approximately 3,000 year journey antigüedad.En be known Querococha Lake and coring the mountains to the tunnel that crosses Cahuish joining the Cordillera Blanca in the Callejon de Huaylas Alley Conchucos. Then descend to the river valley to reach Chavín Mosna Visit to appreciate the famous archaeological Lanzon, Heads, Galleries, an impressive network of internal galleries or labyrinths, columns, porches and a large square stands ceremonial concentric. Return to Huaraz. Hotel to bus station for his trip to Trujillo for a period of 9 hours from 9.00pm to 6:00 a.m. the next day. (Photo: Temple of "Chavin"). Seventh day: "Tour to Pyramids of the Sun and the Moon." Our staff will welcome you at the bus terminal, as indicated and transfer to hotel, free morning and evening hours the hotel will be picked for the tour to the Pyramid of the Sun and the Moon located 8 kilometers from Trujillo , is about 20 meters high. According to tradition was built in just 3 days using 250,000 men and 70 million bricks. This would be a building with funeral, ceremonial and possibly administrative.The Pyramid of the Moon is made of super temples made according to different stages of the Moche. Archaeologists have discovered a tomb with over 40 sacrificed warriors, return to Trujillo. Overnight at hotel in Trujillo. Eighth day: "Tour Brujo Archaeological Complex and the City Tour in Trujillo." I picked up from your hotel to board our vehicle and go north to the Chicama Valley through green sugar cane crops reach the pyramids area Sorcerer's one of the most important religious and political centers of the Moche culture. El Complejo Arqueológico El Brujo está formado, principalmente por las pirámides de Cao Viejo y Huaca Cortada y El Brujo. Luego pasaremos al recinto funerario de Cao, lugar donde se ha realizado uno de los mayores hallazgos en los últimos tiempos" Le recogeremos de su hotel para abordar nuestro vehículo e ir en dirección norte hacia el Valle de Chicama atravesando verdes cultivos de caña de azúcar llegaremos a la zona de pirámides del Brujo uno de los más importantes centros religiosos y políticos de la cultura Moche. El Complejo Arqueológico El Brujo está formado, principalmente por las pirámides de Cao Viejo y Huaca Cortada y El Brujo. Luego pasaremos al recinto funerario de Cao, lugar donde se ha realizado uno de los mayores hallazgos en los últimos tiempos" . Se trata del descubrimiento de la momia de un gobernante Moche que habito estas pirámides hace 1.700 años, se la llamo La Señora de Cao. Los restos momificados de la mujer que tenía una edad aproximada 25 años, estaban cubiertos por collares de oro, plata, lapislázuli, cuarzo y turquesa. Retornaremos a Trujillo para en horas de la Tarde realizar el City Tour de la ciudad. Nuestro paseo se enfoca en tres épocas; pre-colombina, colonial y moderna. Visitaremos el centro arqueológico de la Huaca del Dragón. Finalmente haremos un corto recorrido por la moderna Plaza de Armas y apreciaremos la fachada la Catedral de Trujillo, cuya fundación data del siglo XVII. Pernocte en hotel seleccionado. (Foto: Plaza de Armas Trujillo). Noveno día: " Tour Complejo Arqueológico de " Chan-Chan " y Caleta de Huanchaco. " Will start visiting the Huaca Arco Iris Temple Dragon of the Chimu culture (S. XI to XV AD) whose quadrilateral, is surrounded by a trapezoidal wall six feet high. Then visit the impressive archaeological complex of Chan Chan, El Palacio Tschudi, its walls are decorated with stylized friezes in high relief with zoomorphic and geometric. Visit to Trujillo, ancestral Fishing cove where we will see the ancient Mochica vessels: the totora horses with which it maintains the ancient tradition of artisanal fisheries. Visit the pier, Craft Fair and lunch at the creek. The waves of the spa, lend themselves to the sport of surfing. According to schedule (Tuesday, Thursday and Saturday) in the afternoon Paso Horse Exhibition Peru is known worldwide for his walk to four times, producing a sound very original-PACA PACA-PACA. Recognized as "national treasures and silent ambassador" and best saddle horse in the world. (Photo: Citadel of Chan Chan). Tenth day: "City Tour in Chiclayo." After having breakfast, I picked up from the hotel to pass on to the terminal of tourism and take the bus that takes them to Chiclayo in a span of 3 hours. Terminal in Chiclayo Transfer to the hotel and after a short rest and lunch we will pick you up at your hotel at approximately 14:00 hrs to start the City Tour in Chiclayo, capital of Lambayeque department and communications center in northern country. Visit the Main Square, Cathedral Square Elias Aguirre, Theatre on May 2, Paseo de las Musas.Además, then visit the famous market town Herbalist, also known as Witches Market.Overnight at hotel .. (Photo: Plaza de Armas of Chiclayo). Eleventh day: "Lord of Sipan Tombs Museum - Pyramids of Tucume." After breakfast we transfer to the Royal Tombs of Sipan Lord preserves the material collected by Dr. Walter Alva in the archaeological excavations of Sipan Sipan complex, the exhibition shows the Lord of Sipan with all her jewels, some tombs of warriors Moche and important pieces of gold. The museum's architecture is inspired by the ancient Mochica sanctuaries that combine platforms. He is currently considered one of the best museums in South America.Lunch will be on his own in the afternoon Lambayeque.Por make the tour at the Pyramids of Tucumese characterized by its 26 pyramids, among which are: The Huaca del Pueblo, La Raya, The Sun and The Stakes. Finally overnight at the hotel. (Photo: Lord of Sipan). Twelfth day: "Archeological Sipan (Lord of Sipan)." After having breakfast at the hotel pick you up from hotel for the tour in the Sipan Archaeological Complex (Lord of Sipan), located 35 kilometers from Chiclayo. Place where the intact remains of a dignitary of the Moche hierarchy warrior priest. The construction consists of a low platform and two adobe pyramids. In the finding, that the tomb of the dignitary was accompanied by the remains of a warrior, a priest, two women, a boy, a flame and a guardian with foot amputees. In addition to numerous gold jewelry and plata.Después to enjoy a good lunch will be transferred to the bus tour to take the bus to Cajamarca to 6 hours of Chiclayo, Cajamarca will be waiting at the bus terminal Tourism to transfer to your hotel where she spent the night. After breakfast at the hotel to make an excursion Cumbemayo, On the way visit Bellavista, Layzón, Forest Park, arriving at Cumbemayo walk the Stone Forest, the Sanctuary, the Aqueduct, The Stone of Sacrifice and the famous Friars, Then make an excursion on the farm Collpa One of the most recognized former estates of the countryside maintaining its old house, artificial lake, stables and a chapel, will observe the call of the cows for milking his name for later visit the baths Inka, medicinal thermal water spa, considered the most important of the northern Sierra, the Pozo del Inca and Perolitos source of medicinal waters with a temperature of 78 ° C. and finally spend the night in the hotel in Cajamarca. (Photo: Baños del Inca Cajamarca). Fourteenth day: "Otuzco Necropolis - City tour of Cajamarca." Fifteenth day: "Flight of Cajamarca to Lima and travel by bus from Lima to Paracas." After breakfast we will pick you up from your hotel to transfer you to the airport of Cajamarca and take your flight to Lima where we will be waiting to transfer you to the bus company to take us to the town of Paracas in a span of 4 hours, will be in the city of Paracas where she spent the night in a hotel. Sixteenth day: "Tour to the" Islas Ballestas "and" Reserve of Paracas. " After our breakfast, transfer to the port of Paracas, where we will start the tour to the Ballestas Islands passing through "The Candlestick" After our breakfast, transfer to the port of Paracas, where we will start the tour to the Ballestas Islands through "The Chandelier" a giant picture on the side of a hill.Arriving at the Ballestas Islands, will visit the different islands for two hours, watching the different species of sea lions, seals, penguins and seabirds. After arriving at the port make the tour to the Paracas Reserve. In the afternoon we head to the bus terminal in the city of "Paracas" to take the bus to the city of "Nazca" The journey usually lasts 3 hours, and in Nazca our staff will be waiting to transfer to your hotel. (Photo: Ballestas Islands). Tenth Seventh Day: Flight over the "Nazca Lines". By the morning with breakfast, transfer to Nazca Airport for a 45-minute flight over the Nazca Plains, where the ancient pre-Inca drew huge figures of animals and plants for a purpose not yet discovered, many believe that these figures were made by aliens, among which are the monkey, the spider, hummingbird, etc.. Then we will visit the "Cemetery of Chauchillas" then move the passengers to the bus Nazca to carry out their journey to the city "Arequipa" In the morning with breakfast, transfer to the airport of Nazca, to a 45-minute flight over the Nazca Plains, where the ancient pre-Inca drew huge figures of animals and plants for a purpose not yet discovered, many believe that these figures were made by aliens, among which are the monkey, the spider, hummingbird, etc.. Then we will visit the "Cemetery of Chauchillas" then move the passengers to the bus Nazca to carry out their journey to the city "Arequipa" that usually takes 11 hours, in hours of the morning our staff will make the terminal transfer bus to your hotel in Arequipa where she spent the night. (Photo: The Hummingbird Nazca Lines). Eighteenth day: "City Tour in Arequipa." After breakfast at the hotel have the morning off to rest. In the afternoon, tour to the "White City" After breakfast at the hotel have the morning off to rest. In the afternoon, tour to the "White City" including the Convent of Santa Catalina, undoubtedly the gem of Arequipa, finally open to the public in 1970, having been for 400 years in prison, with countless pieces of colonial art. Also, visit the Plaza de Armas, the cloisters of the Society of Jesus and the districts of Cayma and Yanahuara, with a magnificent view of the volcano El Misti, and visit a traditional colonial house called the Mansion of the Founder. In the evening relax at the hotel. (Photo: Cathedral of Arequipa). Nineteenth day: "Rumbo Tour to the Colca Canyon and Vicuña Reserve." Early morning departure by private bus heading to Colca Canyon, past the volcano Chachani. During the trip, they will cross the plains of Arrieros Cañahuas and where are the Vicuña National Reserve and Vizcachani, The Pulpera Callalli, and Tuti Sibayo Villajes. Arrive at an altitude of 4,000 meters above sea level where they appreciate the flora and fauna of the beautiful natural lagoons and Sea Caught Bofedales with giant rocks in the form of castles. Arrive to Chivay in the Colca Valley for lunch. Afternoon visit to the hot springs of La Calera, where we will stay for a period of one hour and 30 minutes. Bathrooms are these medicinal waters, which surpass 40 degrees, good for physical illnesses. Overnight at the Colca Valley. (Photo: Vicuñas in the pampas of Arequipa). Twentieth day: "Tour to the Colca Canyon and view of the condors." In the morning departure to the "Cruz del Condor" where the canyon begins and can appreciate its depth. From this point we also see a condor in the wild. After a brief stop at the "Cruz del Condor" In the morning departure to the "Cruz del Condor" where the canyon begins and can appreciate its depth. From this point we also see a condor in the wild.After a brief stop at the "Cruz del Condor", we will continue our trip to the Colca Canyon admiring the small towns of Pinchocclo, Madrigal, Lari, Maca, Achoza, Yanque, etc until you reach Chivay where we take the tourist bus bound Puno, the trip takes approximately 5 hours in Puno will be waiting to transfer you to your hotel. (Photo: Condor in the Cruz del Condor in the Colca Canyon.). Twenty-first day: "Tour of Lake Titicaca, Uros Island and Taquile." Twenty Second day: "Travel Tourism Puno to Cusco, visiting Raqchi." Twenty-Third day: "City Tour in Cusco"
Twenty-Fourth day: Free day in Machu Picchu "The Lost City of the Incas"
Twenty-Sixth day: "Tour the Sacred Valley of the Incas." This day tour the Sacred Valley tour that started at 8:30 hrs, collected from the hotel to go to Pisac, which is a typical market, with picturesque terraced fields on the mountain.Visit the archaeological site of Pisac. It is also famous for its fairs where you can buy beautiful handicrafts. Then we head to Urubamba where we have included a buffet lunch. Then we go to the fortress of Ollantaytambo, where descendants of the Incas living in the home of the Incas. Finally we went to Chinchero to see its market and the archaeological group with typical Spanish overlaps the Inca constructions. The tour will end up averaging 19:00 hrs in the Plaza de Armas in Cusco. At night she be given a farewell dinner show at the restaurant El Truco.Pernoctaremos at hotel in Cusco. (Photo: Sacred Valley of the Incas in Cusco). Twenty Seventh day: "Flight from Cusco to Puerto Maldonado and Monkey Island Tour." After breakfast will transport to the airport for your flight to Puerto Maldonado "Capital of the world's biodiversity" After breakfast will transport to the airport for your flight to Puerto Maldonado "Capital of the world's biodiversity." Arrival and welcome reception. We started a tour of the city in our bus and then go to the port to embark Captain on the boat across the Rio Madre de Dios. During the trip, we see the capybara, caimans, turtles, herons, cormorants and other animal species. Arrival at the lodge, an exquisite welcome drink, settle into our bungalows and have lunch. In the afternoon accompanied by our specialized guide, we will visit Monkey Island, 5 minutes from the lodge. During the walk the extraordinary landscapes and exuberant flora that are home to a variety of species of monkeys in their natural habitat, such as spider monkeys, capuchins, lion monkeys, puffins, preserves, and other species like the coati, sloths, among others, and a great variety of birds. During the way to the island enjoying the sun being the most impressive sunset in the jungle. Then return to the lodge for dinner and rest. Twenty Eighth day: "Tour to the Lost Lake." After breakfast we will hike internment to get to the Lost Lake, which is a refuge and feeding ecosystem for a tremendous diversity of animals. It is possible to observe otters, caimans, turtles, tapirs, birds of colorful plumage, the majestic jaguar and a variety of fish. This area is unique and remains intact, with large marshes and natural springs. We'll ascend to and extraordinary vantage point from which to appreciate the magical jungle, followed by a pleasant canoe ride around the lake. Return to the lodge for lunch and afternoon visit the wild tree plantations that are part of the botanical garden. In the evening relax at the lodge . Twenty-Ninth Day: "Flight from Puerto Maldonado to Lima." After breakfast, we embark on our journey back to the city of Puerto Maldonado and enjoy an unforgettable sunrise in the forest, upon arrival you will be transferred to the airport to board your flight back to Lima where we will be waiting to drive to your hotel. Farewell dinner at the Restaurant "Sulco Manor" and night at hotel in Lim. Thirty day: "Moving to Lima Airport and Farewell." After taking breakfast and time to tell us, we will transfer the hotel to the Jorge Chavez airport in Callao. We should be two hours before the time of our international flight, we must consider that we must pay an airport tax of USD 36.00, after checked, we will say goodbye and you take flight to your country.